Imagine being marooned on your own private island in Belize. The crystal turquoise blue Caribbean Sea surrounds you as you lay with your loved one in the soothing sun. A lullaby of waves softly caressing the shore and gentle trade winds rustling nearby palm fronds ease you into absolute relaxation. No need to rush, the only important decision to make is whether to have your gourmet meal, (customized to meet your specific tastes) served at your hammock, on the end of our personal dock, at a secluded spot on the beach or in the comfort of your villa. Casa Solana is secluded on the western tip of our island, allowing guests to bask in the warm glow of Cayo Espanto’s best sunsets. This bungalow’s distinctive Caribbean architecture and chic island decor creates a refreshing and relaxing atmosphere for guests to unwind with an expansive veranda, separate dining area and private infinity plunge pool. Imagine waking up to the most beautiful sunrise in the Caribbean, and then plunging into the tranquil water right outside of your bungalow. Meanwhile, your personal staff will be anticipating your every need. All you have to do is call your houseman, and he will be there with your favorite beverage, fresh fruit and a towel to dry off with. Our starting Belize honeymoon package is priced for Casa Solana, but guests may also select from any of our five premium, Caribbean front, villas. Each of our premium villas has a private, sea front, infinity edge plunge pool and dock. 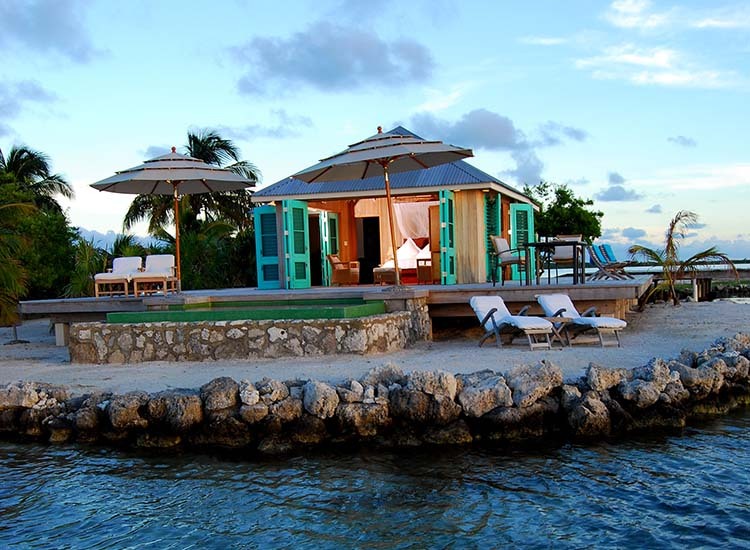 Cayo Espanto combines the ultimate in luxury and seclusion. We invite you to spend enchanting evenings and unforgettable days overlooking the Caribbean while our staff sees to every detail. On your romantic honeymoon, enjoy boating around the islands of Belize, stopping off to snorkel or scuba dive along the reef or anywhere else. Spend exhilarating days of fly fishing within casting distance of your villa. Here bonefish and small permit thrive and even tarpon are but a short boat ride away. Imagine diving or snorkeling the second longest barrier reef in the world, only ten minutes away. Dive Belize’s world famous, natural monument “The Blue Hole.” Walk in the footsteps of the ancient Mayan while exploring the many ruins and mysteries. Our staff can keep you as busy as you like, but Cayo Espanto is the perfect place for honeymooners to lay back, relax and let our staff pamper you. Cayo Espanto is located three miles from San Pedro, in the calm water of the Western Caribbean, off the coast of Belize. Although less than two hours from Miami, Dallas, Atlanta and Houston, Belize remains virtually undiscovered. Cayo Espanto is an exclusive resort for the discriminating few who demand the best that life has to offer. With every conceivable amenity at your disposal and a staff to guest ratio of two to one, Cayo Espanto, your own private island, is where paradise and luxury come together as one for your perfect honeymoon. Choose 4 – 7 night honeymoon stay in our romantic beach villa, Casa Solana. Packages valid January 7th through December 15, 2018. For new reservations only. Packages are subject to change and are based on availability. Private Island Honeymoon and Romance Exclusive cannot be combined with any other offer. Villa changes are accepted with this package, but are subject to availability and rate changes. The Honeymoon and Romance package excludes our holiday season. Rates do not include a 24% tax and resort fee. Some restrictions apply.